Broadcast media promote the idea that the failed businessman who set himself on fire did so because of Netanyahu’s policies. Broadcast media promote the idea that Prime Minister Binyamin Netanyahu is to be blamed for the failed and self-described homeless businessman's suicide attempt when he set himself on fire Saturday night. In case radio listeners did not accept the message, the news anchor repeated the quote. Silman suffered burns over 80 percent of his body and is in serious but not life-threatening condition. 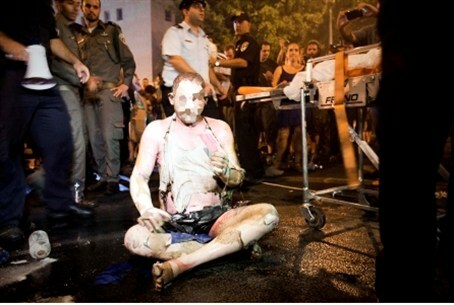 He read a speech at the rally, putting the blame squarely on Netanyahu and Finance Minister Yuval Steinitz for his despair, and then poured a liquid over himself and set himself on fire. It turns out that he is not someone who simply never got out of the vicious cycle of poverty. He was running a shipping business from Tel Aviv for several years until it failed. After working as a cab driver, he suffered a stroke and moved to Haifa. According to a psychiatric report published on Rotter.net, Silman was involved with drugs and theft as a teenager. Nor was this Silman's first suicide attempt: he previously tried to kill himself several years ago as well. The radio outlet first described his plight and his action and how people at the scene tried to save his life by dousing him with water. It then quoted demonstrators who said such a drastic action was bound to happen because of alleged government inaction to solve the problem of a shortage of homes and the high cost of housing, particularly in the metropolitan Tel Aviv area. Prices in outlying areas of the country are far less. Voice of Israel government radio is the most popular radio outlet in Israeli and also has been openly biased against Netanyahu for years, particularly since he beat Shimon Peres in the 1996 elections, upsetting the radio station’s and other mainstream media election night predictions. Silman is not new to the protest movement, and he participated in last summer's demonstrations. He declared Saturday night that the government has refused his pleas for help and said he felt he had no choice other than to set himself on fire, copying a similar event in Tunisia last year that set off a peoples' revolution against the regime. Economic development and social policies in the two countries, however, are vastly different.